Williamsburg Wonderland: "Wonderneath," a new circus theater adventure set in turn-of-the-century New York City, comes to House of Yes in East Williamsburg for six nights, the first beginning tonight at 9 pm. Tickets $20. Located at 342 Maujer St.
Last chance: "New Hope City" plays its last shows this weekend at the Bushwick Starr. Don't miss out on this unique rock opera, set in a land not unlike ours, in a time not too far away. At 8 pm. Tickets $10. Located at 207 Starr St.
Theater: By popular demand, Piper McKenzie is presenting a remount of "Craven Monkey and the Mountain of Fury," one of the critical and popular hits of December 2009’s Fight Fest at the Brick Theater. At 8 pm. Tickets $12. Located at 575 Metropolitan Ave.
Music: Also back by popular demand, Sara Bouchard performs "Songs of Lewis & Clark," her song cycle setting to music the Journals of Lewis & Clark. From 7-9 pm. Tickets $5. Located at 543 Union St. 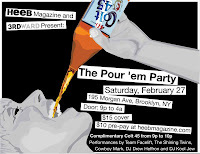 Comedy: Warm up with the BRIC as the producer's behind Celebrate Brooklyn! present a night of comedy with Eugene Mirman and friends at the Bell House in Gowanus. At 8 pm. Tickets $10. Located at 149 7th St. Purim! : It's Purim, which all we really know means people party and get dressed up in costumes. Find out where the party's happening in Brooklyn with our handy guide. 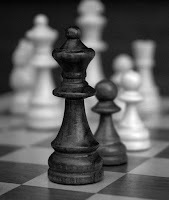 Chess: Think you're the next Bobby Fischer? Test your skills at the inaugural Brooklyn Chess Tournament, presented by the Brooklyn Lyceum in Park Slope this weekend. Registration is $25 for the Scholastic division (Saturday) and $40 for open (Sunday), and is open until the day of, as long as there is still space available. There is no admission fee for spectators. Runs 11 am-7 pm today and tomorrow. Located at 227 Fourth Ave. Hair god: The Williamsburg Hair Man gets immortalized even more, as a short film plays as part of a mini film fest at Music Hall of Williamsburg tonight. Also on the bill are the bands Emmanuel and the Fear and Hank and Cupcakes. At 9 pm. Tickets are $7 in advance, $10 at the door. Located at 66 North 6th St.
Shopping: JCIA is home to a three-day vintage and craft market beginning today, including local vendors such as The Shiny Squirrel, Bonnie English, In Your Closet, Brooklyn Rehab and Sweet Virginia. Stop by on opening day for free mimosas while you shop. Free admission. From noon to 8 pm. Located at 522 Metropolitan Ave.
For the record: The Brooklyn Record Riot returns to the Warsaw in Greenpoint for a day of vinyl deals and finds. Admission is $3 ($20 from 10 am-noon). Snack on kielbasa and other traditional Polish eats while you shop. Til 8 pm. Located at 261 Driggs Ave.
Bowlive: Funk trio Soulive begin their two-week residency at Brooklyn Bowl. If you can't make it tonight, you have nine more shots. At 9 pm. Tickets $10. Located 61 Wythe Ave.
Anna Klinger, executive chef/co-owner of Al di Lá, the uber popular Venetian trattoria in Park Slope, will host a cooking class with her husband, Emiliano Coppa, at De Gustibus Cooking School at Macy’s Herald Square, March 2. Attendees will have the unique opportunity to observe Klinger in the kitchen, eat a five-course meal and ask questions as she shares her culinary secrets. De Gustibus Cooking School is one of the most prestigious cooking institutions in the country, hosting the world’s top chefs as they prepare meals for attendees in an intimate, casual setting. Klinger will serve her acclaimed risotto, which New York magazine calls “sublime simplicity;” a Cuttlefish over Grilled Polenta and Monkfish over Stewed Cardoons. For dessert, she has a Coffee Caramel Custard with Mosica Biscotti planned. Macy’s Herald Square is at 151 West 34th Street, eighth floor. The event runs 5:30-8 p.m. The event is $95, which includes the five-course meal, wine pairings for each course and a free subscription to Food & Wine magazine. For more, call 212-239-1652. Shatner tribute: We mingle with the Trekkies at the Knitting Factory's Shat Ball. Performance art: Who's that knocking at your door? It's Death Bear. Hair man: "Williamsburg Hair Man" gets even more immortalized. Site Fest: Arts in Bushwick returns its successful performance festival for two days of wall-to-wall live programming, from dance and drama to performance art, film and comedy. True confession: Until I set out to write this column, I had never in my life used a cake mix. What made me try one? A new book chock-a-block with recipes whose goal, clearly, is to go beyond the simple cake mix, The Cake Mix Doctor Returns! (Workman Publishing, $15.95), by Ann Byrn. I have to admit I was skeptical. I cut my kitchen teeth in an era of Julia Child worship, when my friends and I were on a first name basis with some of the most revered cookbook writers of all time, whether they knew it or not, whipping up Craig’s recipe for this, or Pierre’s recipe for that. I made everything – and I mean everything! — from scratch, and looked askance at convenience foods. No short cuts for me, in my tiny Manhattan studio apartment kitchen. Fast forward a couple of decades, to my comfortable kitchen in a roomy Brooklyn home, which I inhabit with one (occasionally ravenous) husband and two (frequently ravenous) children, now on the cusp of adulthood. Short cuts, I quickly learned, were not necessarily so bad, especially if they allowed me to feed my family, hold down a job and carve out some free time for myself. But, still, a cake mix? A CAKE MIX? I definitely needed some convincing. So, I turned to Byrn to provide it. A quick perusal of her book made it clear that there was something for everyone in it – sticky frosted cakes, as well as more restrained pound cakes and spice cakes with streusel, and flavors that ranged from citrus to toffee, and pretty much everything in between. But, was it any good? To find out, I purchased my very first cake mix at the supermarket during my Saturday shopping expedition, and, several days later, set out to bake Byrn’s Almond Pound Cake, on an evening when I was home (no assignments taking me across my beat), and also making dinner. The cake quickly came together. It was clear, by comparing Byrn’s recipe with the box, that her recipe was richer and way more elaborate than the basic instructions on the carton: Six eggs instead of three, two sticks of butter instead of a third of a cup of oil, milk instead of water, extra flour and sugar, and dollops of almond and vanilla extract. Once the cake was in the oven, the kitchen and, by extension, the entire house, quickly was infused with the haunting fragrance of almond. 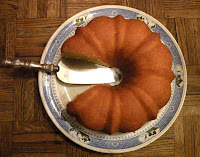 The cake puffed up beautiful, slid smoothly out of the Bundt pan in which I had baked it, and looked gorgeous. But, how would it taste? We sat down to dinner (I had whipped up a main dish pasta – look for that recipe soon – and a pork chop for my husband, who’s not a big pasta fan, while the cake was baking), and waited patiently for the cake to cool, as commanded in the instructions. Finally, it was time to taste. The cake, enthroned on a vintage Spode platter, sliced beautifully, an important first step. The little group of experts gathered around my dining room table took small or not so small slices. My husband complimented the Italiany flavor of the cake, my son and daughter, the texture. While I wondered, at first bite, if the almond flavor was too strong, my husband liked it a lot. By the next day, it had mellowed a bit, and my son – who had been a bit put off by the overriding almondy taste of the cake – eagerly sliced himself a piece when he got home from school. As Byrn notes, “My mother always said a pound cake tastes better on day two or three.” We’ll see if she’s right about day three, if there’s any left. I’m still not 100 percent convinced that mixes will ever replace basic unbleached flour, granulated sugar and various leavening agents as a basis for cake-baking in my kitchen. But, I am willing to give them a few more tries, and have already identified the recipes I want to have a go at: Lemon Streusel Cake or Aimee’s Chess Cake, anyone? 1. Place a rack in the center of the oven and preheat the oven to 350 F. Lightly mist a 10-inch tube pan or 12-cup Bundt with vegetable oil spray, then dust it with flour. Shake out the excess flour and set the pan aside. 2. Place the butter and sugar in a large mixing bowl and beat with an electric mixer on medium-low speed until blended and creamy, 1 minute. Stop the machine and scrape down the side of the bowl with a rubber spatula. Add 1 egg at a time, beating on low speed until each egg is blended into the batter. Stop the machine and add the almond and vanilla extracts and flour. Beat 30 seconds on medium-low speed. Stop the machine and scrape down the side of the bowl again. Add the cake mix and milk alternately in thirds, blending on low speed after each addition. Let the mixer run for another 30 seconds on medium speed to blend the batter well until it is smooth and thick. Pour the batter into the prepared tube pan, smoothing the top with the rubber spatula, and place the pan in the oven. 3. Bake the cake until it is just starting to pull away from the sides of the pan and the top springs back when lightly pressed with a finger, 52 to 58 minutes. Transfer the tube pan to a wire rack and let the cake cool for 10 to 15 minutes. Run a long, sharp knife around the edges of the cake and shake the pan gently. Invert the cake onto a wire rack, then invert it again onto another rack so the cake is right side up. Let the cake cool for 25 to 30 minutes longer, then slice and serve. Keep it Fresh! Store this cake, in a cake saver or covered with plastic wrap, at room temperature for up to one week. Freeze the cake, wrapped in aluminum foil, for up to six months. Let the cake thaw overnight on the counter before serving. Note: You may use any milk you have in your refrigerator in this recipe. If you use whole or evaporated milk you will have a richer cake. Groceries are way too expensive. Thanks to this terrible economic crisis, it seems every single item in Waldbaum’s is ridiculously overpriced. Five bucks for milk? Six bucks for a pack of yogurt smoothies? Get real! This week, I wanted to make a cheap dish that could last for several days - and not taste like rubber when reheated in the microwave. I settled on Potatoes and Eggs. My family calls this Italian comfort food - and Italian poverty food. Seems fitting for this task. I borrowed my mother’s recipe (she made this all the time when I was a kid) and was unhappily surprised to discover that it’s much more difficult than I expected! Now, I thought I’d just fill a bowl with a few eggs and some potato pieces. Not so! First, I sautéed onions in a frying pan then added the chopped potatoes to brown. I’m kinda getting the hang of this sauté thing but the sizzling sounds still make me nervous - and ready to duck splashing oil. The next step was what I had envisioned - beating eggs in a bowl. Only one itty-bitty shell fell in! I added the eggs to the frying pan and, according to the recipe, was to turn the entire dish over when the underside was brown. Huh?! The trick, my mom advised, is to cover the pan with a large plate and flip that sucker upside down. Then you slide the grub, brown side up, back into the pan. Uh, yeah, I don’t wanna do that. But, sadly, I had to. I really did try my hardest but that pan was heavy! And hot! I managed to get the food on the plate and then back in the pan but trust me, it wasn’t pretty. And I may have lost some potatoes along the way. Verdict: What a sloppy mess! Flipping the frying pan upside down proved to be quite difficult - and emotionally scarring - for me. It left me with a broken glop of smooshed potatoes and eggs! It may not have looked pretty, but it sure tasted good! In a round frying pan, sauté the onion in olive oil until transparent . Add potatoes, continue to sauté on medium heat until almost browned. Add red pepper. In a bowl, beat the eggs, adding salt, pepper and parsley. Add egg mixture to sauté pan. When set and browned on the underside, loosen it with a spatula. Cover with a round plate and flip pan upside down. Slide potatoes and eggs back into the pan with browned part on top. Cook for five minutes. From March 5-7, Brooklyn goes country with the Brooklyn Winter Hoedown, shining a spotlight on the borough''s bustling country scene. Main event: Brooklyn Country Music Festival (the sixth annual was at Southpaw in Park Slope last September, so look out for that this fall); also organizes the yearly Cash Bash, with the 78th birthday celebration happening this Friday, February 26 at Southpaw, featuring the Whiskey Rebellion and Sister & the Sisters (sold out - we warned you!). Why he does it: "I visit clubs locally and do my best to reach out for bands I have never heard before to get them involved with the festival and the Web site." He’s the writer from Iowa who didn’t go to the famed Iowa’s Writer’s workshop at the University of Iowa. 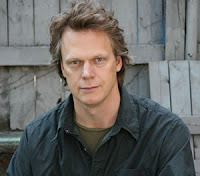 But Iowa’s loss is Brooklyn’s gain, and author Peter Hedges’ latest tome, “The Heights” (Dutton), offers up an often funny and captivating story that looks at contemporary life in Brooklyn Heights. Hedges, who wrote the novel and the screenplay, “What’s Eating Gilbert Grape,” got the idea for the novel in late 1997 while sitting with his young family on a park bench in Pierrepont Playground as he began imagining what could happen in the neighborhood. “I thought it was a great place for this story to occur. I took notes for many weeks and locked onto the idea of writing about a good marriage, and wanted to have that marriage go through an unthinkable test,” said Hedges. The novel, which took 12 years to write, was interrupted several times by screenwriting assignments on the films “About a Boy” and “Dan in Real Life,” but slowly began to take shape. The story involves the middle-class couple, Tim, who teaches at the Montague Academy, an exclusive private school in Brooklyn Heights, and his wife, Kate, who get involved with the wealthy Anna. Then, their lives become unhinged by a secret invitation from an unlikely messenger. While there appears to be some similarities between real places in Brooklyn Heights and Hedges’ own life, the author insists the novel is a total work of fiction. “I took great care in creating Montague Academy and Oak Lane where the main characters exist by setting up a fictional school and fictional street,” he said. Hedges said his wife is from Brooklyn and the couple decided to move to the borough after their children were born. This includes walking the 15 minutes from his home in Boerum Hill each day to his studio office in Brooklyn Heights. Although originally from Iowa, Hedges attended college at the North Carolina School for the Arts, and then came to New York, where he wrote several plays before getting his big break with “Gilbert Grape,” which starred Johnny Depp and Leonardo Di Caprio. He still sees the two actors from time to time, most recently running into Depp at the recent Tim Burton exhibition at MOMA. Hedges said Brooklyn Heights as the setting for the novel is also a tribute to a great neighborhood where such writers as Thomas Wolfe, Norman Mailer and Arthur Miller lived and wrote. He also is proud to count himself as one of the growing number of writers to now call the borough his home. “Brooklyn is the place to be and live from an artistic standpoint and this is Brooklyn’s moment. It’s a very vibrant scene,” he said. 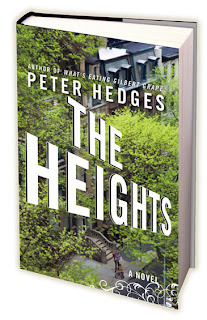 Hedges will be reading from The Heights at Book Court, 163 Court Street on Thursday March 4 at 7 p.m. When Soulive first came up a little more than 10 years ago, the music business was just beginning to change. The past decade has seen the band evolve along with it, recording in their own studio, launching their own record label, and putting up their own videos online. From the beginning has been Pete Shapiro. The band would jam in his Manhattan club, Wetlands, back in the day, playing there more times than any other club, even since. This month, they play a two-week residency at his newest venture, Brooklyn Bowl in Williamsburg, adding new notches to the belt with 10 nights of funk-infused music. Soulive will do just that over the course of the residency, aptly named “Bowlive,” pulling from their many albums and EPs, as well as inviting as many friends as they can to join them each night. No surprise that they did do it. Since the band started, they’ve been able to make things happen. The first time they all sat down together and jammed, they wound up with their debut album — “Get Down.” Soon, they signed to Blue Note Records and started getting regular gigs in New York, including Wetlands, and all over the world (the band’s especially big in Japan). A little over a year ago, they started their own label – Royal Family Records – putting out their own music, including most recently a live session recorded in Tokyo, as well as others. Label mates include Lettuce, Adam Deitch and Nigel Hall (an appearance by these guys throughout Bowlive is likely). With music downloads so prevalent, the band has also been big on immediately getting out media on their own terms, whether that means CDs right after they’ve finished clearing the stage or uploading videos of shows to their Web site. “When we go on tour, people record anyway and put it online. That’s why we started doing it ourselves. Here’s a little bit of quality control,” says Krasno. With their next releases, the band also looks to play more into instant gratification. With that said, 10 years from now, don’t be surprised if Soulive comes full circle yet again with another set of gigs at whatever club Shapiro’s manning then You heard it here first. Soulive do Bowlive at Brooklyn Bowl (61 Wythe Ave) March 2-6 and March 9-13. All shows at 9 pm. Tickets $10 on weeknights and $12.50 on weekends. For more information, call 718-625-2100. Greenpoint News takes a look at the new Coco66, where These Are Powers recently celebrated the release of their new “Candyman” EP. The band wowed, thanks in part to the renovations. "The impressive sound (bass, in particular) was part of a new era for the Greenpoint bar and live music venue, which, since October, has been undergoing improvements aimed at transforming Coco 66 into a first-rate establishment for more shows, bigger shows and better shows," says the paper. Coco66 is located at 66 Greenpoint Ave.
Brooklyn is channeling its inner geek. One week after the American Crossword Puzzle Tournament took over the Brooklyn Marriott, another sport that takes skill with brains comes to the Brooklyn Lyceum. From February 27-28, the Park Slope bathhouse-turned-venue will host the inaugural Brooklyn Chess Tournament, an all-ages affair that looks to trump up the borough’s place on the chess map. Indeed, from the dominance of Edward R. Murrow High School in chess circles to the legacy of Bobby Fischer, chess and Brooklyn are somewhat synonymous. All that’s missing is a tournament, and Eric Richmond, program director of the Brooklyn Lyceum, thought it was high time the borough had its own. Helping to kick things off is a Brooklyn chess champion – Maurice Ashley, the first African-American chess International Grandmaster and, as a resident of Park Slope, a neighbor of the venue. He is helping co-produce the tournament and will provide commentary, as well as challenge 12 players to a round of 12 games at one time. Saturday, February 27, will be devoted to nurturing young chess players in the Scholastic division (grade school, middle school, and high school levels). Membership in the U.S. Chess Federation is mandatory for high school competitors. Sunday, February 28, will be open competition (membership to the USCF is also required to compete and can, if necessary, be procured at the event). This day will also see chess players vying for over $2,000 in prize monies, awarded to first, second and third place. For non-competitors, there is no admission fee, and tournament games will be simulcast on a large screen, with commentary provided by Ashley, so you don’t miss a single move. People are also welcome to play their own games amongst themselves. For competitors, registration is $25 for the Scholastic division (Saturday) and $40 for open (Sunday), and is open until the day of, as long as there is still space available. The tournament is Swiss style, and you must bring your own chess sets, boards and clocks. The tournament runs 11 am-7 pm February 27 and 28 at the Brooklyn Lyceum (227 Fourth Avenue). For more information, call 718-857-4819. Most drama in basketball happens on the court. For the ladies of the Bed-Stuy Bulls, it’s in the locker room. “Shoot 2 Win” follows a day in the life of seven friends who play on a competitive league as they try to reach for the gold in a city-wide tournament. But between cheating husbands and drug abuse, basketball’s the last thing on their minds. Donna Marie Augustin originally saw the production in her native London, and wanted to bring it to Brooklyn, where she’s lived in Bedford-Stuyvesant for the past three years. In putting on the show for an American audience, the script, written by Jo Martin, Josephine Melville and Tracey Daley, needed some “translation.” Netball, which the original focused on, became basketball. Obscure British/Caribbean slang (“Stop talking stupidness”) was reworked, with help from Brooklyn writer and director Nelson George (whom Augustin worked with on the forthcoming film “Left Unsaid”). But the story remained the same. As soon as the lights go on, the women enter the locker room one by one, each carrying their own demons – Shenequa (played by Augustin) and her drug dealing on the side; Jackie and her alcoholism; Carrie and her bad luck with men; Mandy and her drug abuse; Zoe and her racial identity crisis; Bev and her faith; and Sandra, who has the biggest weight to carry of them all. Despite the severity of their problems, the play does have its light-hearted moments as well, including an impromptu dance sequence and clever dialogue. But, thanks to heated words between the friends and serious soliloquies from each actress, the play strives to uncover those truths that are right below the surface, and on the tip of everyone’s tongue. Off the court, they’re still on the defense. Besides the script, another draw for Augustin was the opportunity to have an all-female, nearly all-black ensemble piece. After a few days at the Cherry Lane Theatre in Manhattan, the production comes to Brooklyn’s Kumble Theater for the Performing Arts March 3-7. Tickets are $22, $15 for students, seniors and groups of 10 or more. The theater is located at 1 University Plaza. For more information, call 718-488-1624. Couture fashions are gorgeous — but who can afford ’em? Next month, iconic French fashion designer Jean Paul Gaultier will unveil his affordable women’s apparel capsule collection for Target, which has three stores in Brooklyn. The bull’s-eye retailer has made a name for itself thanks to these fashionable collaborations. Gaultier is probably the biggest name to join forces with the chain store. A sneak peek at Gaultier’s designs has Pumps & Pleats drooling! Many of the designs put a French spin on American staples. Take, for instance, the classic khaki trench coat. Gaultier created a $59.99 version for Target with a chic trio of black stripes near the shoulders. Rather than pair it with a stiff suit, the trench is thrown over a filmy kelly green dress with white polka dots and black lace trim. The lingerie-inspired dress seems quite risqué under the coat. Ooh la la! The cropped leather motorcycle jacket in black with red trim is already a hit with fashion bloggers. Expect the slick jacket to sell out quick — even at the $199.99 price tag. There’s much more affordable fare in the collection — a sleek tank dress for $34.99, a black pinstripe vest for $29.99 and a peach tee bearing the “JPGaultier” name for $19.99. In true Gaultier style, expect some of his Target designs to be avant-garde. Mesh leggings come in an abstract “tattoo print” mixing scales, flames and flowers. Sounds weird? It is. The price tag, $24.99, is also rather high for leggings. The collection will be available from March 7 to April 11. Chili: A Brooklyn chili cook-off finds a winner in Char No. 4 chef Matt Greco, beating out General Greene's Julie E. Farias. Tapas: It's a tapas smackdown in Williamsburg, as our sister publication reviews two new digs: Ooba and Xunta. Borough: It's a classic - Brooklyn versus Manhattan - in TONY this week. They ask local restauranteurs, including folks from Franny's, Roberta's, and Saul, if they would cross the bridge. Slate Gallery presents an exhibition of new work by Miriam Cabessa, featuring her new series of gold paintings titled, “79,” after the atomic number for gold. The exhibition runs now through March 7, with a closing reception March 5 at 6 p.m., with a Gold Party at 9 p.m. Slate is at 136 Wythe Avenue in Williamsburg; call 718-387-3921. It’s a double dose of metal this month. On March 6, Liturgy and Naam head to Williamsburg for a set that’s sure to blow the water out of Union Pool, a welcome home for metal heads. Out of Brooklyn, Liturgy in particular has been blowing up in recent months with their black metal, thanks to shows at The Blackened Music Festival at Le Poisson Rouge, as well as non-metal circles, including a New Yorker Festival show and shout-outs from a Dirty Projector. Their music equally draws from a range of influences: the solemn 11th century chants of Perotin, the allegorical prophecies of Blake, the apocalyptic vision of Scriabin, the mass-media spirituality of Jodorowsky, the cataclysmic transcendence of Glenn Branca’s post-minimalist collective no-wave drones. Also a Brooklyn band, Naam delves more in stoner rock, with the trio molding elements of classic psychedelia and prog with modern elements of jam-heavy bliss and apocalyptic amplitude. Hear them March 6 at Union Pool (484 Union Ave.) at 9 pm. Tickets $10 $8. For more information, go to www.myspace.com/unionpool. COUSIN CORINNE and BOOKCOURT proudly announce the launch of COUSIN CORINNE'S REMINDER, a biannual publication that features new writing, photography, and comix from artists around the world. BOOKCOURT'S General Manager and Events Coordinator, Zack Zook, is COUSIN CORINNE'S founding owner and executive editor. He has teamed with a variety of highly talented NYC editors and curators to craft this remarkable series. Writing: Charles Bock, Mark Borthwick, Todd Colby, James Frey, Ben Lasman, Donald Moss, Shira Nayman, Alice Notley, John Burnham Schwartz, Emma Straub, Anne Waldman, John Wray, and Hannah Zeavin. Comix: Mike Cavallaro, Jen Ferguson, Jonathan Lethem & Dean Haspiel, Tim Hall & Jennifer Hayden, Michel Fiffe, and Kat Roberts. Photography: Mark Borthwick, Mona Kuhn, Noah McLaurine, and Kimiko Yoshida. Following “The New Electric Ballroom,” “Black Watch” and “The Walworth Farce,” the latest production for St. Ann’s Warehouse in DUMBO is another alum of the Edinburgh Fringe Festival. Naturally though, the drama couldn’t be more different. The life in question in the play, which won the festival award last year and makes its US premiere in Brooklyn, is Bette Bourne’s, a seminal British gay activist and drag queen. The story is told on stage to Mark Ravenhill, one of the UK’s celebrated playwrights (here, his first play, “Shopping and F---king,” had a sold-out run at New York Theatre Workshop in 1998). A story told between friends, and adapted from a series of private conservations, the performances are, not surprisingly, honest, at times humorous, others angry. The plot moves from Bourne’s post-war childhood to his first walk across Trafalgar Square in drag, to his seminal role in the formation of the Gay Liberation Front and the creation of his OBIE Award-winning queer theater company BLOOLIPS in London and New York. More than a memoir, it’s a celebration of the momentous struggles and achievements of gay liberation. The show comes to St. Ann¹s directly on the heels of a successful February run at London’s Soho Theatre, running March 4-28, Wednesday to Saturday at 8 p.m., Saturday at 2 p.m. and Sunday at 4 p.m.
Tickets are $30-$55 and are available online and by phone at 718-254-8779. St. Ann’s is located at 38 Water Street. Brave New World Repertory returns to the stage this month with a new site-specific production of Arthur Miller’s play, “The Crucible,” directed by Claire Beckman, at the Old Stone House in JJ Byrne Park, at Fifth Avenue between Third & Fourth streets in Park Slope. “The Crucible” is a 1953 dramatization of the Salem witchcraft trials, which took place in the Province of Massachusetts Bay during 1692 and 1693. Miller wrote the play as an allegory to McCarthyism, a time when the US government blacklisted accused communists. Miller himself was to be questioned by the House of Representatives’ Committee on Un-American Activities in 1956 and was convicted of “contempt of Congress” for failing to identify others present at meetings he had attended. For this production, audiences are limited to 50 per show; admission is $18. Performance dates and times are March 4, 5, 6, 11, 12 and 13 at 8 p.m.; March 6 and 13 at 2 p.m. and March 7 and 14 at 7 p.m. Artist Phyllis Frendendall opens the first in the spring series of the G-Train Salon, “Fleece into Gold,” with fiber artist Fredendall at Urban Alchemist Design Collective, March 6. Fredendall’s work explores the relationship of memory to place, creating “maps” felted in wool and silk, inspired by her own journeys or based on stories of family members. The show and discussion starts with 7 p.m. cocktails and an 8 p.m. talk. The exhibition is on view through April 6 at the Collective, 343 Fifth Street (off Fifth Avenue) in Park Slope. Pumps & Pleats: Time to shop! T.J. Maxx is coming to Brooklyn! Have you ever wondered how Brooklyn’s fashionistas can afford $600 Rebecca Minkoff satchels and $300 L.A.M.B. stilettos in this economy? I always do. Well, here’s the answer - they’re secret discount shoppers. 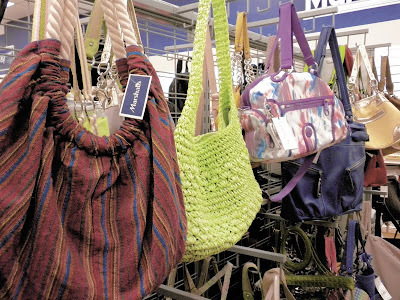 Purchasing purses and pumps at a designer discount store like Century 21 in Bay Ridge or Loehmann’s in Sheepshead Bay isn’t as elegant as shopping in Madison Avenue’s posh boutiques, but it will save you some green. That’s why Pumps & Pleats is super excited that T.J. Maxx may soon open on East 15th Street between Kings Highway and Avenue P in Midwood. Maxx has a few locations in Manhattan, Queens and Staten Island, but this will be the chain’s first store in Brooklyn. In honor of the shop’s reported October opening, I visited Marshalls on 86th Street in Bath Beach, which is owned by the same company as Maxx and sells the same designer duds. Really, these stores aren’t that much different. The cool thing about Marshalls is that the purses are arranged by color. If pink purses aren’t your thing, head on down to the green section, or hop to the blue corner for a turquoise tote. It’s totally fun! This Bath Beach Marshalls is more organized than the one in the Atlantic Center mall in Prospect Heights, but be prepared for purses left on the floor and shoes randomly strewn on the racks. Frankly, any designer discount shop you visit will be a mess. To deal with the crazy conditions, you must be patient and determined to scour every last rack for that one fabulous find. That’s how I found the mate for a single fire engine red Tahari pump. Perseverance pays off! Marshalls [1832 86th St. between Bay 19th and Bay 20th streets in Bath Beach, (718) 621-3434]. Get your costumes ready! The Jewish holiday of Purim is this weekend, and Brooklyn's throwing a lot of parties. Dust off your costumes, shine your dancing shoes and get ready to guzzle. From the organizers: "When the Jews of ancient Persia avoided extinction, God commanded them to celebrate by getting so drunk they couldn't tell their friends from their enemies. Sounds good to us! Jewish or not, put on a costume and join us!" The night features Team Facelift, The Shining Twins, Dirty Fences, Cowboy Mark, DJ Drew Heffron, and DJ Kook Jew. During its grand opening weekend of CastleBraid, an artist-focused support system of facilities, classes, and professional services, is holding a Purim-theme dance party, so grab a costume and enjoy two floors of DJs, dancing, drinks and more. Mark the holiday with a traditional megillah reading, following by a performance from Soulfarm. They brought you the Lecha Dodi remix of Akon, then the Shir HaShirim Moroccan beat meditation, now they are onto Israeli party music. 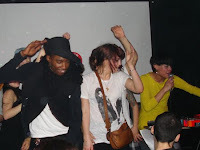 Brody & Diwon will be joining the party fresh from their Israel and West Cost tour. Rachel Coleman, aka "Pop Jew," aka the worst cook in America, hosts this bash, featuring the So So Glos, Beachniks, Tough Knuckles, and Sundelles. Costumes encouraged.